The rover Spirit failed to carry out directions it received on Sunday, its 1800th day on the Martian surface. Another anomaly, according to Nasa, was that the day's activities were not saved to the rover's long-term memory. As of Wednesday, the rover seems to have recovered and is responsive to commands from Earth. The Jet Propulsion Laboratory (JPL) team operating Spirit will begin diagnostic tests to determine the cause of Sunday's glitches. The rover reported receiving its instructions on Sunday but pictures at the beginning and the end of the day showed that it had not moved. Engineers tried to determine Spirit's precise location on Tuesday by locating the sun with the rover's camera. The rover followed commands and located the sun, but not in the location in the sky that Spirit anticipated. "We don't have a good explanation yet for the way Spirit has been acting for the past few days," said JPL team leader Sharon Laubach. "Our next steps will be diagnostic activities." 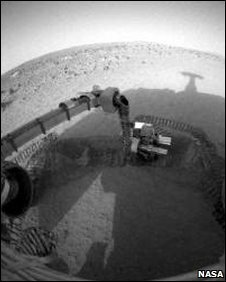 One theory holds that the rover's electronics could have been damaged by a cosmic ray - a fast-moving particle from the sun or elsewhere in the galaxy. Whatever the cause, the problem appears to have corrected itself. "Right now, Spirit is under normal sequence control, reporting good health and responsive to commands from the ground," Mars Rovers project director John Callas said.